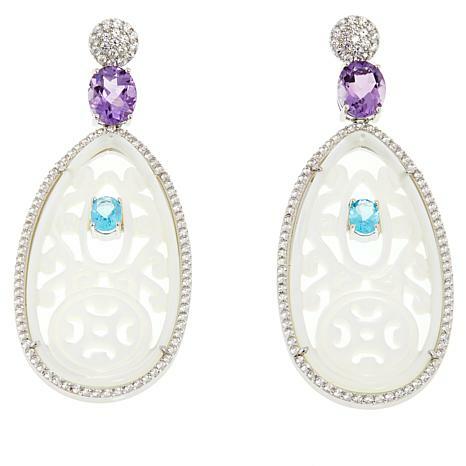 The charm of Mother-of-Pearl and the glitz of beautiful gemstones, these drop earrings have it all. At nearly 3" long, they make a big impression; you don't need to say a word. Signature worthy? Oh, yes! 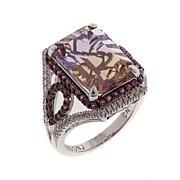 Exquisite, upscale designer, red carpet WORTHY!! These are comfortable and amazing on! 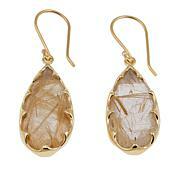 Stone colors are clear, clean, crisp and sophisticated! ! !The ornate MOP carving is reminiscent of Auction house, one of a kind, pair of Estate earrings....or walking down 5th Avenue and seeing these in shadow box display. .....WORTHY! !!! Photos do not do justice. You will be notice in these unique, statement makers whether in an elegant t-shirt/jeans, pastel linen suit, or summer gala gown. Pav zirconia enhances beautifully carved MOP iridescence which practically glows in every light. Have had quality issues in past with some Rarities pieces, but these arrived w/ stones intact & very secure. Stones nice clean colors. Omega backings would have been preferred for such large, yet lightweight earrings. I absolutely loved this earrings but this is the 3rd Rarities purchase made recently that has broken the first time out. Carol: Might check you quality of workmanship, hon. 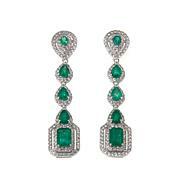 These earrings are phenomenal, stunning in design, incredibly lightweight. Stones are clear & beautiful! I understand the collectible aspect of many of Carol's pieces. I purchased these and was placed on a waitlist. I truly believe production was rushed to meet the demand as a result, earrings arrived with three stones lose in the box, and the bezel is dented on one of them. Because they are truly collectible, I will keep & repair them. I'm greatly disappointed in the lack of quality control.